I read Matched before I started blogging, so no review to link you to. Basically, the first time I read it like four years ago I was like nice, but.... blah. I recently reread Matched so I could read Crossed and I really liked it! I wasn't able to pinpoint why exactly, but I think it's because being older now I don't expect the booms and bangs as much and a quieter struggle seems more realistic to me. The first time I, like everyone else, thought not enough happened. Structurally speaking, the Matched trilogy is a bit like The Hunger Games to me- Book 1: Girl gets personal reason to despise government. Book 2: How Girl makes her way to the rebellion. Book 3: Rebellion. Of course, this is only structure-wise, and obviously I haven't read Reached (book #3) yet but that's what it looks like it's gonna be. So! 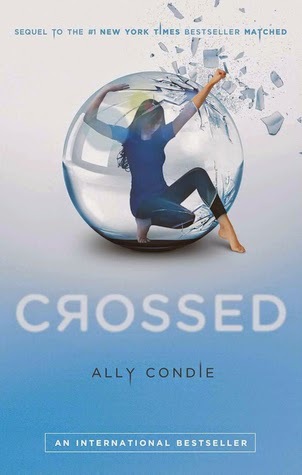 A lot more happens in Crossed. More interesting characters are introduced (something I thought Matched was lacking in) and more ground is covered, literally and figuratively. Ky's POV is introduced which I thought would be more fun than it was. He sounded a lot like Cassia, but we learned more about him and his past, which is good. Pacing was not- because of both POVs, it was almost like we rehashed everything twice. There were no major surprises that are coming to mind now, but Indie made for quite an unpredictable character (even though I didn't like her much). About the love triangle: Alas, no modern YA series seems to be complete without it (*sarcasm*). First time I read Matched years ago I was Team Ky. My last reading of it made me firmly Team Xander, and I remained on that side all throughout Crossed no matter how much I love Ky. I heard mixed things about the first book in the series so I never picked it up. But it is still a series I am interesting in so maybe I should read it. Im glad you enjoyed this one.